1. If you experienced a crash or other abnormal behavior, please attach the log file 'beaTunes-logs-2018-04-14-105114.zip' by dragging it from your desktop onto the 'Attach File' button below. Hey, wonderful program! 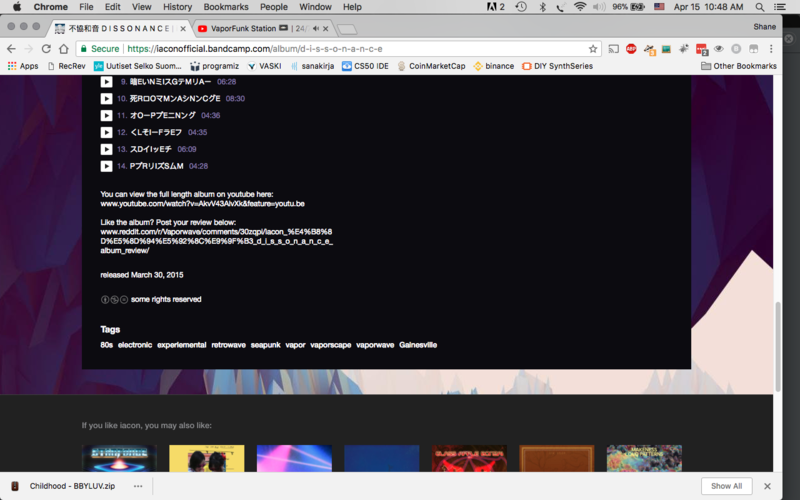 I'm just wondering if it's possible to use the tag information from bandcamp.com to inform the matchlists in the program. I have a huge bandcamp library with many different migro-genres that are included in the tag information but don't seem to translate into the program. Is this maybe something I could use the API for? Cheers! Are the tags embedded in your files? If so, can you send a sample? On Beatunes, I see the previously used tags section (second screenshot). might have would be very much appreciated! incorporating website tags in beaTunes is not super-trivial. But I'll have some solution for beaTunes 5.1.4. You might want to watch https://blog.beatunes.com/ for updates on this. 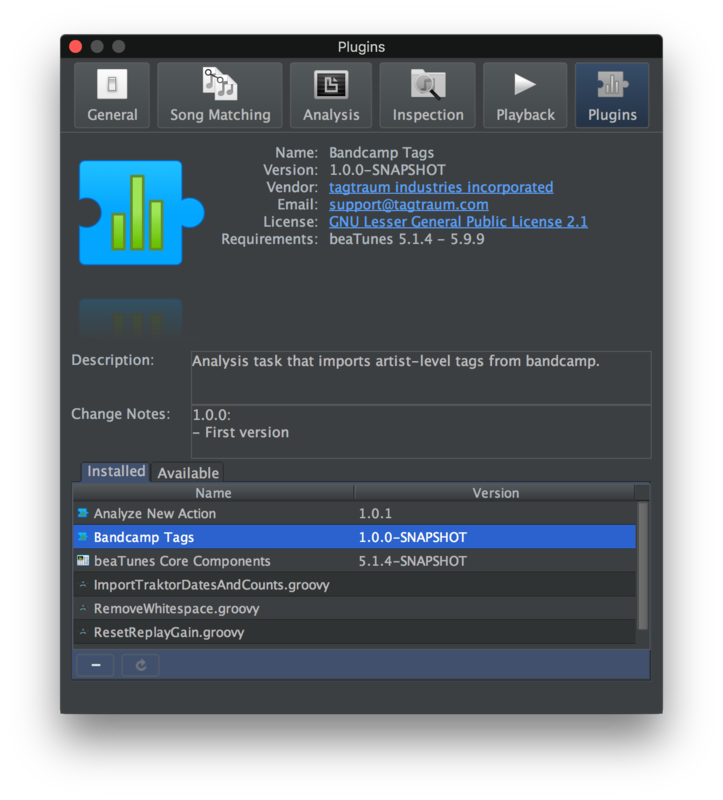 Then download the plugin https://www.beatunes.com/download/bandcamptags-1.0.0-SNAPSHOT.jar To install the plugin, you have to place it manually into beaTunes' plugin directory and restart beaTunes. Please see http://help.beatunes.com/kb/plugins/how-to-install-a-plugin for details. In the tags section of the Get Info dialog there is a little round button that lets you import top tags. This will search both LastFM and Bandcamp. In the analysis options (that's the dialog that pops up, when you choose to analyze something) there is a new task (at the very bottom, you'll have to scroll) called "Import bandcamp tags". Simply enable that task. 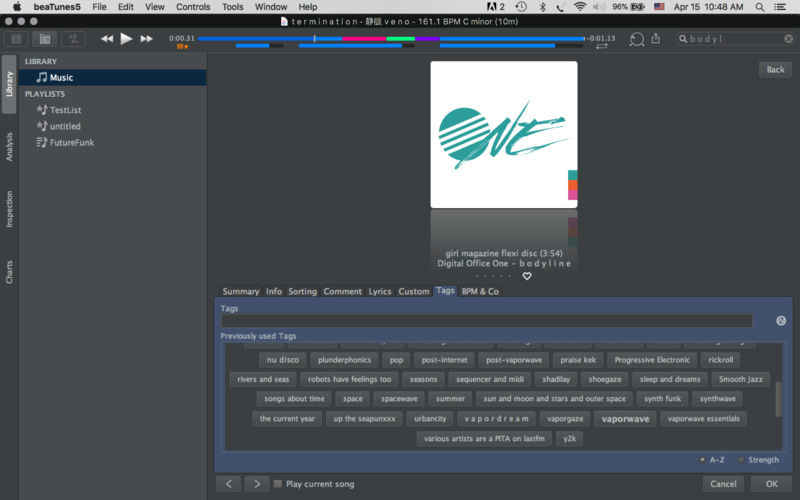 Unfortunately, bandcamp does not embed some sort of real ID into its files. But it does embed a comment like Visit https://someband.bandcamp.com. beaTunes reads this comment and then accesses the site. This is somewhat hacky and won't work if you have chosen to manipulate the comment field in some way. So your mileage may vary. I will and thanks again for your rapid response. I’m blown away by your program, it’s really fantastic! If you run into any problems with this, please let me know! PS: After 5.1.4 is out, the plugin will be available via the regular plugin download mechanism. Applications. Is it possible to put the plugin there? most likely you are looking at the wrong Library folder (macOS has multiple ones and hides the one you need). To navigate to the correct Library folder, open Finder and open the menu Go and then Go to Folder.... Then enter ~/Library/Application Support/beaTunes/. The ~ is absolutely essential for this to work. You're very welcome. Thanks for testing this! Again, please let me know, should something not work.